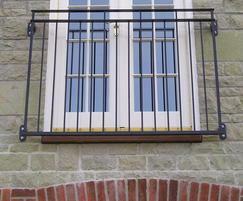 The Byron Juliette balcony design features an additional attractive horizontal rail on the top which enhances its simple style and suits both contemporary and more classic styles of property. This elegant design of this Juliette balcony has a particularly stunning impact visually when fitted with full length patio doors. The Byron Juliette balcony offers exceptional sight lines and levels of safety and protection to enable the resident to enjoy the views of the surrounding area from the comfort of their living space. 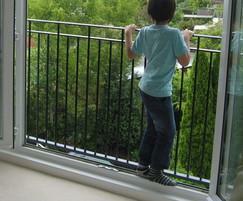 Doors can be opened wide and whilst occupants are kept safe by the protective metal bars of the Juliette balcony. For an architect or designer the addition of Juliette balconies to an exterior façade provides the unique ability to create large airy indoor spaces and differentiate and improve the exterior façade of a housing development to give it a unique look and feel. The Byron Juliette balcony is available in five standards widths: 1264mm, 1570mm, 1876mm, 2182mm and 2488mm, however bespoke designs and widths can be manufactured to order. 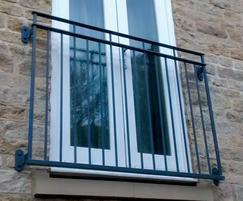 Each Juliette balcony is 1100mm high and comes with a 25-year guarantee. Most are powder coated black, but a range of alternative colour options is also available. We stock an extensive range and can manufacture additional quantities really quickly, so in the majority of cases orders can be fulfilled within 14 days of order. If you do not have an existing credit account with Alpha Rail, we can also take payment by cheque or credit card. Alternatively you can apply to set up a credit account. Ordering form Alpha Rail is easy, simply contact a member of our sales team. To view the full range of juliette balconies available from Alpha Rail please visit www.alpharail.co.uk, call us on 01623 750214 or use the product website link on this page.